Playing with Papercrafting: 150,000 Page Views, A Survey with BLOG CANDY!!! I just did it! I reached 150,000 page views with my Playing with Papercrafting blog! I am excited to have hit that milestone and I want to thank the ones who have made it possible - YOU, my readers! To do that I have decided to give away some BLOG CANDY! I went and ordered the Kinda Eclectic Stamp set before I realized that SU was giving it to us at Convention, so I now have two - this one brand new, not even yet assembled. I also for some unknown reason ordered 2 of these Lovely Lace embossing folders. And I have a full pack of retired High Tide DSP to give away as well. How do you get a chance to win?? 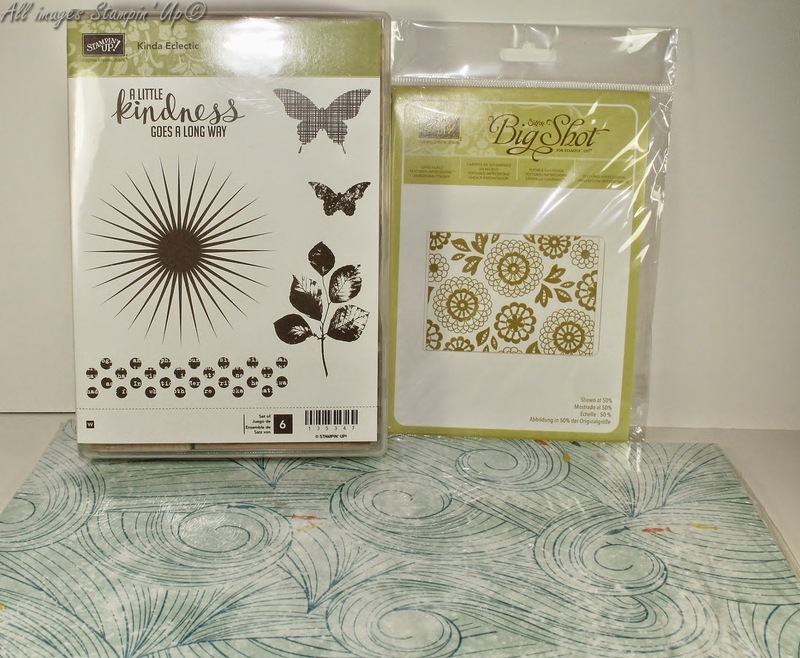 I was hoping to do a little research along with this give-away, so, in order to win, leave a comment on this post about how you are receiving Playing with Papercrafting blog posts: Is it Bloglovin', Facebook, Email, Google+, Google Friend Connect or some other way? Thanks for helping me with this. When you comment, include your email address so I can get in touch with you if you are a winner. *Note: You must live in Canada to enter. **You do not need to purchase anything to enter. ***Winner will be selected randomly on Friday, August 8 at midnight PDT. *If you are not living in Canada, but would like to comment, I will send a selection of 5 of my recent hand-stamped cards to the out of country winner. Just indicate that you are not a resident of Canada. Once again the random draw will take place on Friday, August 8 at midnight PDT! That gives you 4 days to enter, but don't leave it until that last minute! Thanks, Harma. Your name goes into the draw! I didn't think I liked this stamp set until I saw it in person. That sunburst is more versatile than you think! I see your posts on FB and get your emails, but yours is one of only TWO blogs that I have bookmarked in my web browser and check each and every day. Glad you got a visit from your daughter and grandson! Such a great picture of the two of you stamping a purple octopus!! Hi heather ; ). I get your notifications from email and Facebook. Cheers! I've put your name in the draw, Rebecca. You are in the draw, Kim. Hi Heather! I'm in the USA but I read you on Feedly. Love your blog. D dot nuce at comcast dot net. Thanks, Donna! I'll enter you in the out of country draw! Yay! USA! get it on facebook and enjoy the tips and ideas. Thanks. Facebook :) Wonderful work Heather! Thanks, I have you in my draw! I get you on facebook and e-mail. I love how you share little bits of yourself with us every day on your posts. Thanks, Eunice! Your name is in the draw! You're in, Sandra! Thanks for being a reader! Hi, Polly! You're in the draw! Thanks for the comment! Your name went in the draw, Laura! Thanks for your comment. hi heather, i have just gotten my comp back up and running, since being without for a few weeks....oh the pain. I have your site bookmarked on my browser and follow you that way. Thanks, Holly. Glad you have your computer back. Your name is in the draw! Thanks, Tamara! Your name is in the draw! Hi Heather! Fb and emails. Is that you, Daphne? Not sure whose name to put in the draw! Thanks, LeAnne! I'll put your name in my out of country draw!